These cookies are as simple to make as the classic chocolate chip, but way more impressive. The only thing that may be hard to find is the pistachio extract. I haven't been able to find it at my local supermarket, so I bought mine off amazon. It comes in pretty handy for anything you want to add some extra pistachio flavor, from cakes to cookies! Yum! This recipe starts with creaming the butter and sugars. To that I added an egg and the pistachio extract and beat until light and fluffy. I added the flour, baking soda, baking powder and salt. Then the ground pistachios. Pistachios are a bit of a luxury item and nuts can be pretty pricey. But I've found that Trader Joe's sells bags of nuts for reasonable prices and works great for any of my recipes. 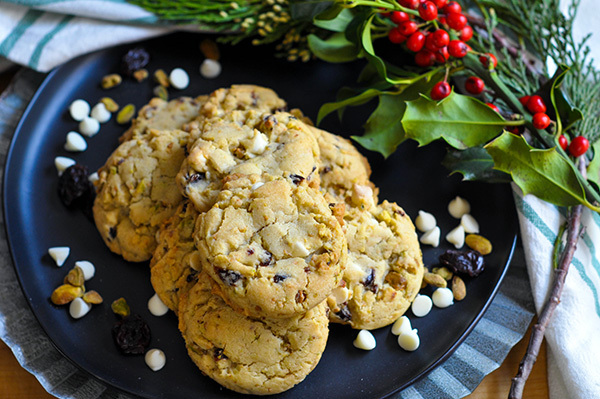 For this cookie, I bought the Pistachio nut meats and ground them myself in my mini food processor. Once the dry ingredients were mixed into a cohesive dough, I folded in the cherries and white chocolate chips. Then I put this in the fridge for about an hour. You can leave this in there overnight if you wish. This helps the flour absorb the wet ingredients and develop a better flavor for your cookie. Once chilled, I used a medium sized cookie scoop and scooped the cookies out about 2 inches apart on a parchment lined cookie sheet. I used my fingers to flatten out the cookies a bit and baked them at 325F for 13 minutes. I would watch the cookies as they bake and take them out once they are golden brown. I like to leave them a bit underdone in the middle. I hope you give these cookies a try for the holidays. They're so festive with the green from the pistachios and red from the cherries they'll make any dessert table even more special! And don't forget to follow me on Instagram or twitter for more on my bakes! Cream the butter and sugars. Add the egg and pistachio extract and beat until fluffy. Add the flour, baking powder, baking soda and ground pistachios. Mix until we’ll combined. On low speed mix in the chopped dried cherries and white chocolate chips. 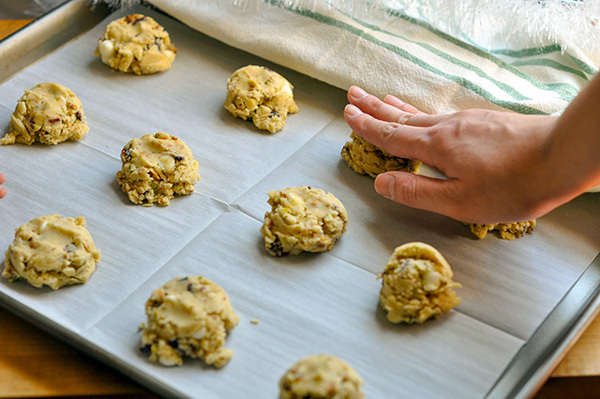 using a medium cookie scoop, scoop dough and place about 2 inches apart on a parchment lined baking sheet. Flatten the dough slightly using your fingertips and bake for 13 min.